Miller 64 is the beer for people that don’t like beer, but have friends that drink beer, so they drink this beer to fit in with all of their beer drinking friends. It tastes like a beer flavored seltzer, but with less flavor. I’ve ranted on the Miller ads for quite a while. Especially this particular campaign. Light beer is a myth. I drink whatever beer I please and weigh around 136 lbs. Go figure. OMG, if you think those horrible “sea shanties” are better than the beer, the beer must be truly awful. Because those “songs” are embarrassingly bad, like “turn away I can’t stand to watch” bad. LOL! The truth is that I actually wish it tasted worse than it did. That would mean that it had actual flavor. Bad flavor, but flavor nonetheless. To say this is the Wonder Bread of beer would be an insult to Wonder Bread. Mrs. G-LO described it perfectly. In retrospect, I wish I had this on hand the night before when I was trying to make a Whisky Highball. The seltzer in my fridge was kinda flat. This would have been a fine substitute. In my mind, cheap watery beer has a place. When I switched from micro-brewed goodness to whisky, all my alcohol time was allocated to the whisky. I needed something to gulp down with a meal and I don’t care for soda or sweet drinks and I’m lactose intolerant. Sometimes I want something more substantial than water so I use the cheapest non-alcohol beer substitute on the shelf. I still enjoy a micro-brew if I’m at a party and didn’t bring my own whisky bottle and glass. I bring extra glasses for the curious folks. Gotta spread the love. I can totally respect one’s craving for a low alcohol beer to go with a meal, but I would argue that there are better alternatives to the generic macro swill that are everywhere to be found. Don’t get me wrong, I love a high octane, high flavor beer as much as the next craft beer geek, but sometimes, you need something lighter. I would go with the following depending upon my mood: Victory Donnybrook Stout or Swing Session Saison, 21st Amendment Bitter American, Founders All Day IPA, Brasserie Dupont Avril, a Lindemans Lambic, Dogfish Festina Peche. I know that all of these beers have a marginally higher ABV than Miller 64, but they also have tons more flavor. This might be the most succinct thing I’ve ever heard from Mrs. G-LO. And, it was as on point as it was to the point. I just don’t understand why people drink “beer seltzer”. You’re preaching to the choir Brother Limpd! On a positive note, it was wet and very bubbly. Lousy ads, which no doubt sell a ridiculous amount of lousy beer! Which I guess makes them good ads. Still lousy beer though. Well said! Thanks for the comment! My wife works at an elementary school, where her 3rd grade students would run around the playground singing this song. Yes, 8 year olds are too young for beer, even if it’s “watered down,” but Miller certainly did well in impression. From an advertising perspective, I suppose this means a good job. From a moral perspective, I am sad inside. Gaaddammit now I have that jingle stuck in my head too. Yup. I second everything you said. Beer without regret? Who are they kidding! I regret every calorie of this bland swill that I consumed. All 15 of them! 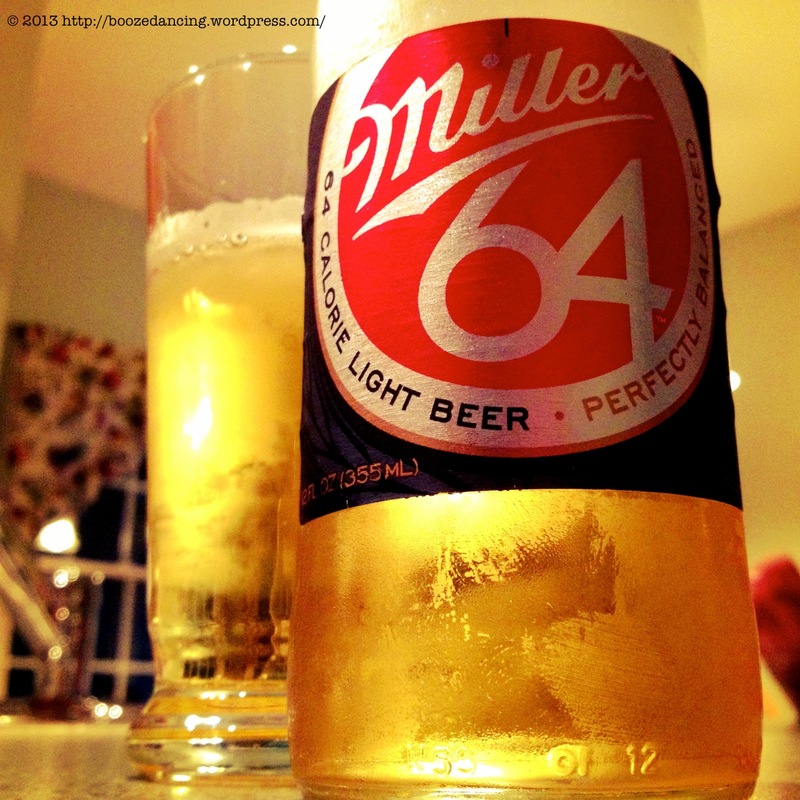 miller 64 in my opinion is a great tasting beer!! No harsh or bitter after taste, and as a women i find this low calorie low carb beer perfect for me!! alot of regular beers are way too strong for my taste and can easily give me an instant headache!!! i don’t know why in the world people find it bland or awefull, mabey all the other bitter bad tasting beer killed your taste buds!! Love Miller 64!! !